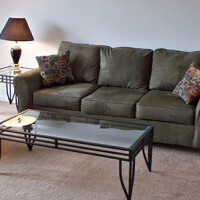 Simple Student Intern Living Room Groups are packaged with Coffee Table, Side Table and Lamp. Micro-Fiber Upholstery is available in Calcutta Olive and Chocolate. Pricing varies with length of rental or lease span.